When inflammation or infection persists in the bone around the end of the root after a root canal procedure, your endodontist may perform a microsurgical procedure called an Apicoectomy. "Apicoectomy" is simply a fancy word for removing the infection at the end of the root. 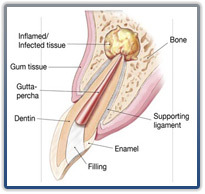 The endodontist opens the gum tissue near the tooth to see the underlying bone and to remove any inflammation or infected tissue. The very tip of the root is removed and a small filling may be placed to seal the end of the root. Advanced technology such as the microsurgical microscope, ultrasonics, and digital imaging are used alongside expert specialized training and clinical experience to solve these complex problems. What can I expect during and after the Apicoectomy? Most cases take about an hour. Current advances in techniques and anesthetics make treatment very comfortable during the procedure. Intravenous Sedation & local anesthesia are used in our office to provide a comfortable and pleasant experience. Patients receiving Intravenous Sedation report an excellent dental experience and do not remember the procedure. Some post-operative swelling can be expected after the procedure which will subside completely in 5-7 days. Most patients can return to work about 4 days after the procedure if they follow certain restrictions. Post-operative discomfort can be relieved with over-the-counter or prescription medications. Follow Dr. Saltzman's instructions carefully. We will have you return to our office in one week to follow-up and remove any sutures that have not dissolved. The endodontist can save most teeth, even those with significant problems. There is no substitute for a natural tooth. Apicoectomy is less expensive than the removal of the tooth and an artificial replacement. Actually, the value of a natural tooth is irreplaceable. Most dental insurance policies provide coverage for apicoectomy (endodontic micro surgery).